The Festival of Colors is just round the corner and once again everyone will be planning what food to have as friends and families get together to enjoy this festival. Like many festivals in India, it celebrates the good over evil. It also marks the end of winter and the beginning of spring, but take it from me I don’t think there was a spring season in Bangalore, from winter it went straight into summer. It is very hot here. Hiranyakashipu, a demon king wanted to take revenge against Lord Vishnu who had killed his younger brother. Hiranyakashipu prayed for years and was granted a special boon by Lord Brahma that literally made him indestructible. He asked Lord Brahma to grant him immortality but Lord Brahma could not grant that wish as all must die one day. Instead of that Lord Brahma granted Hiranyakashipu how he can die..his death wish. This made him very arrogant. He asked his people to worship him like God. There was much terror and fear everywhere, God has his ways and thus Hiranyakashipu’s son Prahlad was an ardent devotee of Lord Vishnu. This made his father very angry. He decided to kill his own son as he would not stop worshipping Lord Vishnu. He asked his sister Holika who had a special boon that fire could not destroy her, to sit with young Prahlad in her lap in the huge fire. Prahlad kept on reciting Lord Vishnu’s name. Holika got burnt completely and Prahlad was saved. After that Lord Vishnu took the form of Lord Narasimha, half man half lion and killed Hiranyakashipu. He was killed at the doorstep, at dusk, on the lap of Lord Narasimha and the tool used were the claws of a lion. This took care of the boon that he was granted. Next day people celebrated with colour and feasting. But how did colors become part of Holi? This dates back to the period of Lord Krishna (reincarnation of Lord Vishnu) . It is believed that Lord Krishna used to celebrate holi with colors. Colours were made from natural materials. He used to play holi with his friends at Vrindavan and Gokul. They used to play pranks all across the village and thus made this a community event. That is why till date Holi celebrations at Vrindavan are unmatched. For this Holi festival, I decided to make a simple but healthy dessert. Cooling, healthy and easy to make. I made a thandai chia pudding. What is thandai? Thandai is a mixture of spices, nuts and dried rose petals which comes in the form of a powder or syrup. It is added to milk and everyone enjoys this cool drink while playing with colours. I always feel that Holi is incomplete without thandai. Every Holi I make something different using the famous thandai powder which I make at home. Lightly roast the fennel seeds in a pan over low heat. Make sure they don’t burn. Roast the poppy seeds over low heat till they begin to pop. Make sure you stir them all the time. Using a food processor, process the mixture into a fine powder. Mix the milk, chia seeds, sugar and thandai powder in a bowl. Cover the bowl with a lid and put the mixture in the fridge. Let the chia seeds swell till the mixture becomes thick. Best to leave it overnight in the fridge. Spoon the pudding into serving bowls or containers. Sprinkle chopped nuts, saffron and rose petals on top. Serve immediately or leave it in the fridge till required. For a vegan version use plant based milk. You can make the thandai powder ahead and store it in an airtight container. Make the chia pudding a day ahead of the festivals. For a little more spicier pudding add more peppercorns. This post is part of Holi ke Rang organized by DESI BLOGGERS CONNECT facebook group. 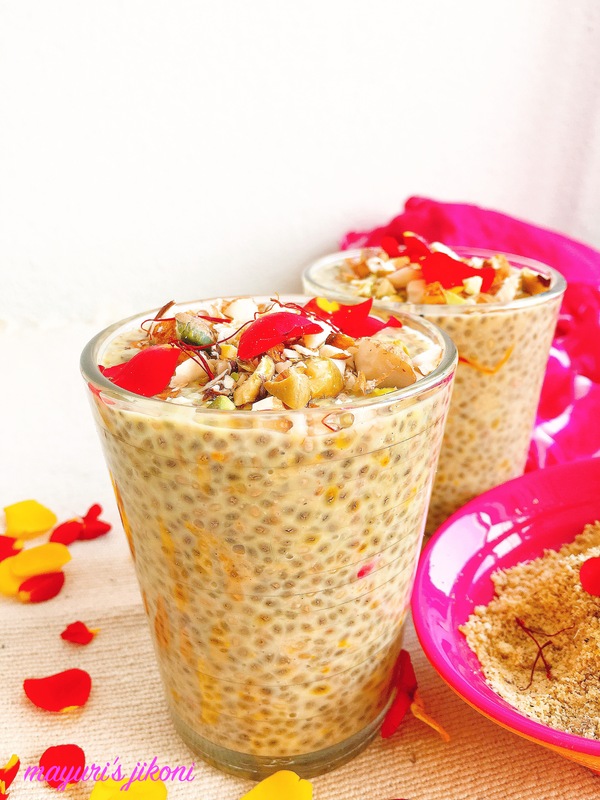 Chia pudding with thandai sounds absolutely delish. How unique and interesting this recipe sounds!! Perfect healthy way to enjoy traditional thandai on holi. That is such a wonderful idea to infuse thandai in chia pudding, absolutely bursting with amazing flavors. What a drool worthy post Mayuri. It’s such a filling drink with thandai and chia seeds. I am sure that family and friends are gonna relish this superb coolant. Lovely clicks. Happy Holi to you in advance. Most welcome Amrita and thanks. Most welcome Geetanjali and thanks. I would have this wonderful breakfast on a Holi day in the morning, to get in the mood for HOLI celebrations, such a nutritious treat with desi touch. Amazing idea… Chia seeds with Thandai flavour , sounds si great. Looks superb. Lovely capture. Will surely try some day. Wonderful share for the festival .. Thank you so much Ruchi and please do try it. Thandai Chia Puddng looks and sounds so flavorsome. Lovely share for the theme and loved your mythology narration. Loved the fusion of Chia seeds in thandai.. The glass of pudding looks so inviting. Though it is still cold here but I won’t mind grabbing a glass and relish the pudding. Perfect for Holi and coming summers.. Thanks Swati, as my cousin who lives in UK says, it may be cold outside but its warm enough inside to enjoy a cold dessert. What a lovely idea to use thandai powder in a pudding! Love the clicks dear; looks so tempting! Thank you so much Priya. Hope you love the recipe. This Thandai Chia pudding recipe looks and sounds equally delicious. I love the story behind the Holi festival as well. A very interesting culture that I enjoy learning about. Thank you for sharing. Thank you so much Scott and most welcome. Learning about different cultures makes the world a smaller place. Chia pudding with thandai sounds interesting. It looks absolutely delicious with the beautiful pictures.Definitely going to try this.Happy Holi dear. Thank you so much Pavani. Interesting story and delicious recipe! Perfect for dessert or even breakfast! Thanks and yes perfect for breakfast or as dessert. I’m going to try this. I literally just bought stuff to make cia pudding for the first time. I’m excited to try this. Thanks Mary, please let me know if you enjoyed it. This looks absolutely wonderful. I love the colours and the picture too. I love chia puds and never added fennel seeds. I must try this. The whole thandai powder in the recipe makes the pudding taste so different. Try it. This is something new to me. It sounds delicious and refreshing, something to try out with family and friends in the summer days. Thanks Joanna, it makes a healthy breakfast too. This is so pretty–I imagine that it tastes just as good as it looks. Gorgeous photos! I keep meaning to try chia pudding, I love the way this one looks and the flavours sound fantastic. I haven’t tried a chia pudding yet but it’s something that is on my list of things to do soon and I love the spices that are in this one! Thanks Corina, please try out the recipe. Am sure you’ll like it. That looks so delish but it looks like it needs a lot of preparation. I love pudding so I’ll definitely try this. Thanks Nina, it doesn’t need much preparation. Its an easy recipe. Thank you for sharing this recipe. i love chia seed in my oatmeal and I’m sure I will here too. I’ve never had Chai pudding before but it doesn’t look too bad, I’d be willing to try it. Thanks Luna, try it, its healthy and filling. This recipe sounds so unique, and the history behind it is wonderful. I’ll have to give it a try. I’m always looking for new recipes. Thank you so much for sharing. Thank you Erica and most welcome. Let me know how it turns out for you. Looks good, but unfortunately I’ve got a slight oral allergy and many nuts and seeds make my entire mouth itch and my tongue will get welts on the sides, so I’ll be skipping this one, but everyone else enjoy! Oh my allergy to nuts and seeds, means you have to be so careful as so many ready made foods contain that. This looks so delicious! Love the addition of chia seeds, and this only adds on to the excitement of Holi! Will definitely try making at home! Thanks Swagata. It is a lovely cooling and healthy treat. With Holi round the corner in India, this Thandai seems to be the ideal treat for the occasion. It is and the festival is incomplete without thandai and thandai related foods. My husband has been wanting to have all of his Indian friends from work over for a foodie night at our house and this will be a great dish for me to wow them with!!!! It definitely is a great easy dessert. The thandai powder is an outright Indian nut and spice mixture. Go on, make it and am sure they’ll love it.